On 1 December 2018, Kiran Gorwade fell off a building in New Delhi and died. He had arrived from a village in Shirol taluka, Kolhapur to partake in a farmer protest rally. Within days, Kiran Gorwade's death and unpaid loan story will be old and relegated to a page on the World Wide Web. The plight of farmers in a swiftly 'developing' India is becoming deplorable. This is not the first time a protesting farmer lost his life in an unfamiliar urban zone and may not be the last. History is rife with instances of farmer deaths and suicides during agitations. Ironically, in the recent history, most of the protests have been staged to demand justice for farmers who have committed suicide because of recurring losses due to crop failure, drought, low prices, debts among other reasons. Despite conflicting reports on how the protesting farmers are 'managed' by political parties to drive home brownie points against a ruling party, the deaths are real. A death or two makes for news but doesn't really change things on Ground Zero. - In April 2015, an impoverished farmer from Dausa, Rajasthan committed suicide by hanging from a tree at a protest rally in New Delhi. - In July in the same year, a peaceful protest in Mavla taluka of Pune against the laying of a water pipeline and an anticipated water scarcity turned violent and resulted in killing of three farmers in police firing. - A couple of years later, in June 2017, five farmers were killed and several injured when police fired on protesting farmers in Mandsaur, Madhya Pradesh. The farmers were gathered to demand better prices for their produce in the drought-affected region. - Farmers from the sugar bowl state of the country, Uttar Pradesh were distraught when during a peaceful 'dharna' in Baraut, one of them died. They were demanding payment of dues by sugar mills and lowering of hiked power tariffs. The farmers leave behind their families, children, land and homes to trudge to cities, miles away, in the scorching heat without food and water just to be heard. They come in thousands, stage their protest for justice and return to oblivion...mostly alive and battered but sometimes dead. They have no names, faces or voices. All they have is hope. A hope that should always be upheld. 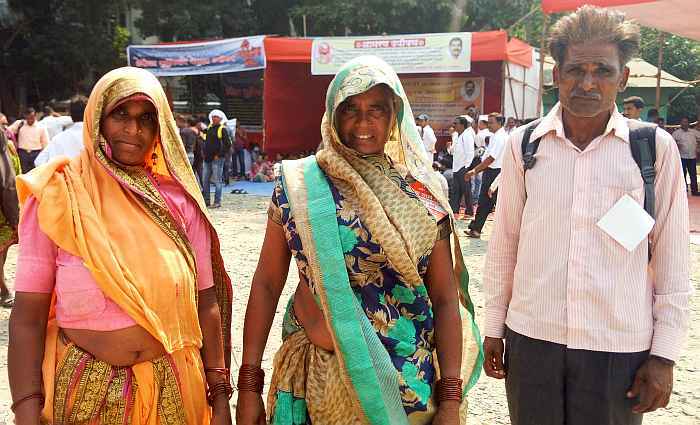 Jair Singh and Gunti Behen from Navanagar village in Nandurbar district walked for miles before finally resting and agitating at Azad Maidan in Mumbai. Accompanied by 68 more people from their village, the couple has come far to demand what is rightfully theirs. Jair Singh was working as a labourer before he took up farming in 2005, but has not been given the 7/12 extract yet. Vatsalabai from Karmad village, Jamner Taluka of Jalgaon district in Maharashtra is one of the 40 people from her village who gathered at Azad Maidan in Mumbai. The title of her land has not yet been cleared by the government authorities leaving the future of her family uncertain. 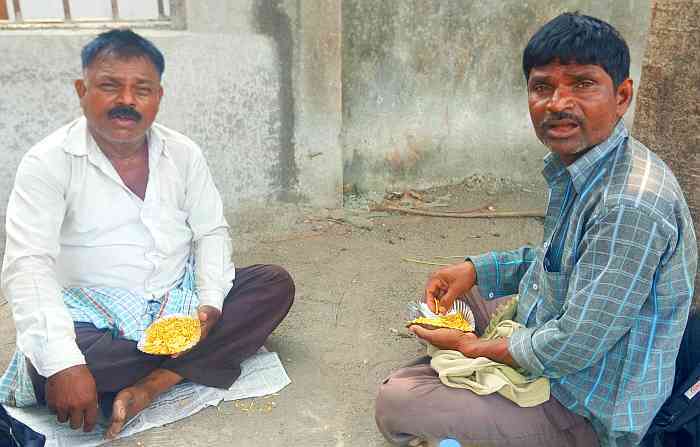 Bharat Singh Sama and Devidas Gavind of Akkalkuwa taluka, Nandurbar district in Maharashtra have one and two acres of farming land respectively in their village but they have not yet received the 7/12 extracts that disqualifies them of the benefits given by the government. After all, the very title of the land they possess is not clear. They are not alone as some 40-odd people from the Padvi tribe in this village arrived to protest collectively in Mumbai. Gema Shankar Barela of the Pawra tribal community (samaj) from Krishnapur village, Chopda taluka of Jalgaon district has been actively fighting for farmer rights in his village since 2001. Along with 70 farmers from his village, he reached Azad Maidan to register his protest. He has 4 acres of farming land without a clear title as 'the process of getting a title for one's own land is a very slow and cumbersome one'. Frequent visits to the Collector's office and other government offices have failed as the authorities don't process applications despite assurances. Surmibai Barela also from Krishnapur village is a sexagenarian and belongs to the Pawra tribal community. Despite her age-related ailments, she came to Mumbai all the way from Jalgaon to extend support to the farmer protest. Pawra tribals Indubai Singh, Urmilabai Sursi and Suresh Bansi from Satrasen village, Chopda taluka, Jalgaon district are unhappy and upset. They are tired of the repeated assurances from the government which promises to resolve their issues 'in the next three or six months'. They have been getting the same response for the last five years. In fact, the government has even sent them notices that they will not get their 7/12 extracts. Despite protests and rallies in Chopda there has been no progress which is why they have come to Mumbai to demand justice. And this is not it.. there are many more - with bruised feet, young mothers with infants and elderly who brave the heat, fatigue, hunger, thirst, pain and agony ... only to be heard. These are the invisible faces of agitating farmers of the country while they're alive.